salsa and tomato jam. I went out to my garden to find MORE tomatoes. Now what? 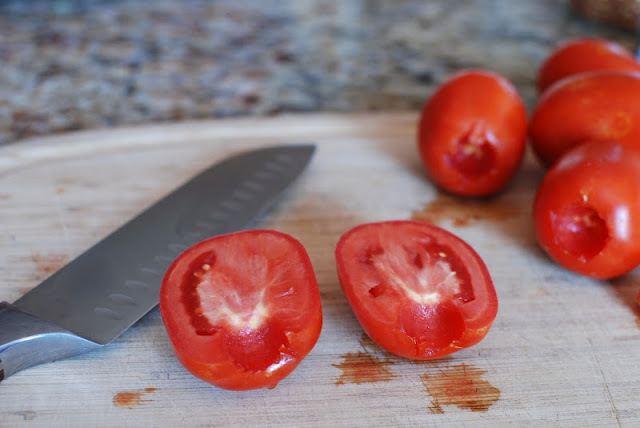 I read an article in my local newspaper about slow roasted tomatoes. Perfect! 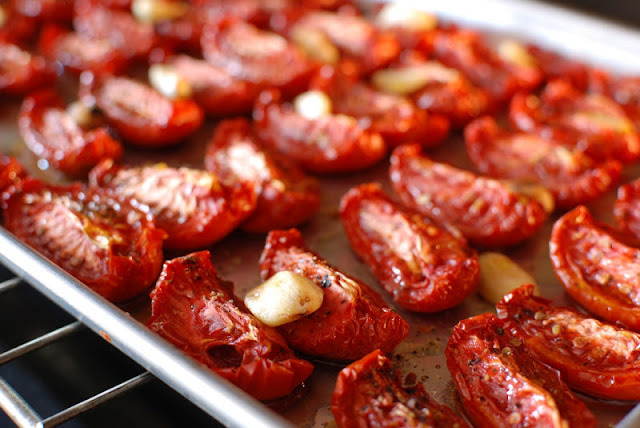 I love slow roasted tomatoes. I decided to really slow roast with my oven set at 175 degrees. Prep time was about 10 minutes with 10 hours of roasting time. I can do that in my sleep…literally. 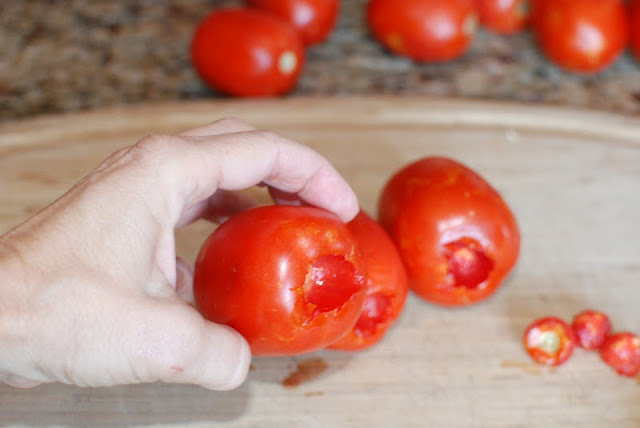 Cut the tomato in half length wise. 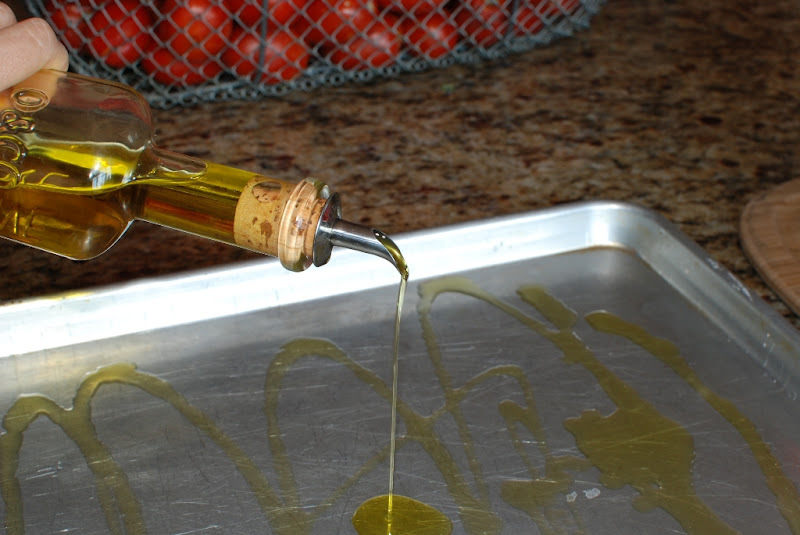 Drizzle a baking sheet with extra-virgin olive oil. Arrange the quarters on a baking sheet. Drizzle tomato wedges with more olive oil. About 2 tablespoons. Dot the tomatoes with a clove of garlic every now and then. 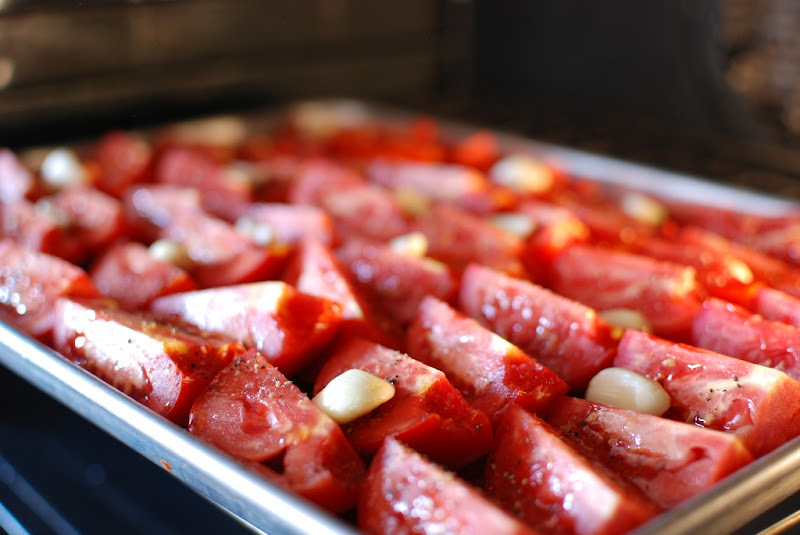 Place the tomatoes in a preheated 175 degree oven. Bake for 10 hours. Go to bed or go shopping. 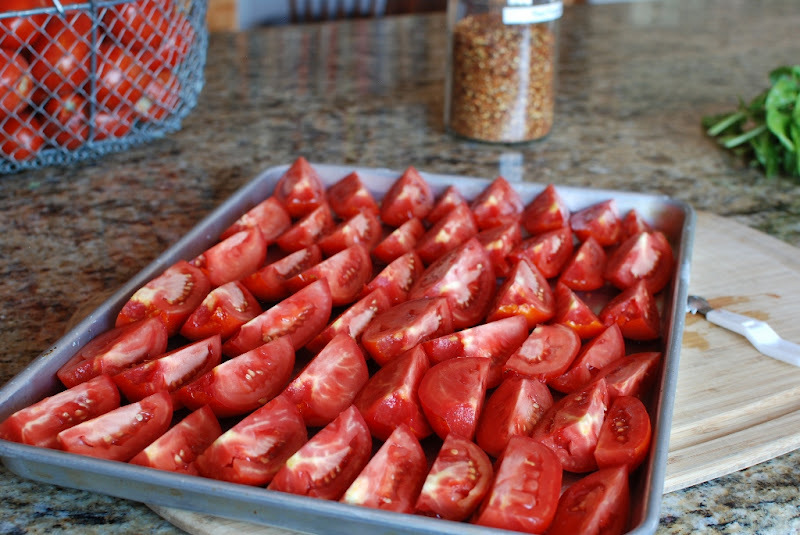 After 10 hours your tomatoes will look a bit shriveled and dried. 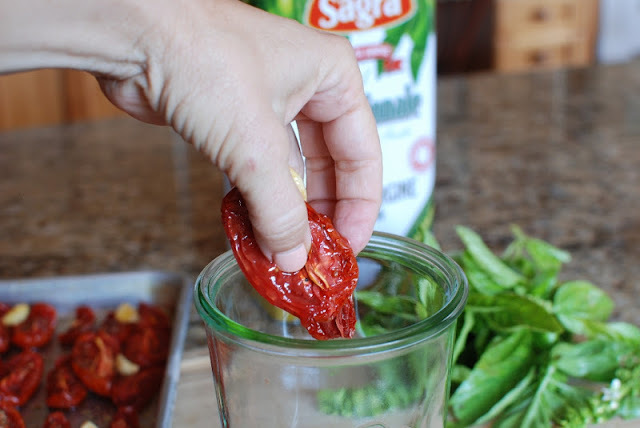 Your house will smell like you have been slaving or a pot of Marinara. 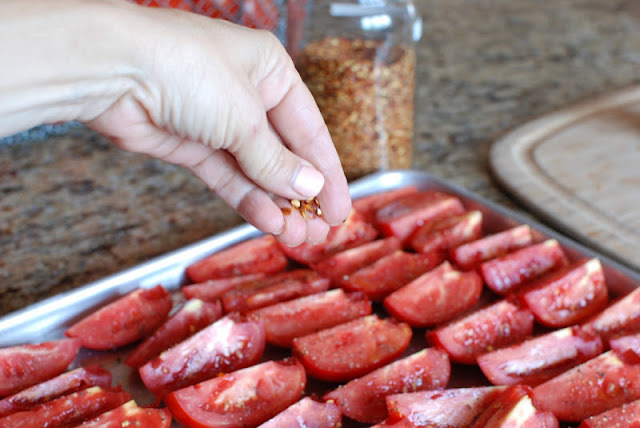 Remove the tomatoes from the oven. At this point the skins can be removed very easily. I’m going to leave the skins on. 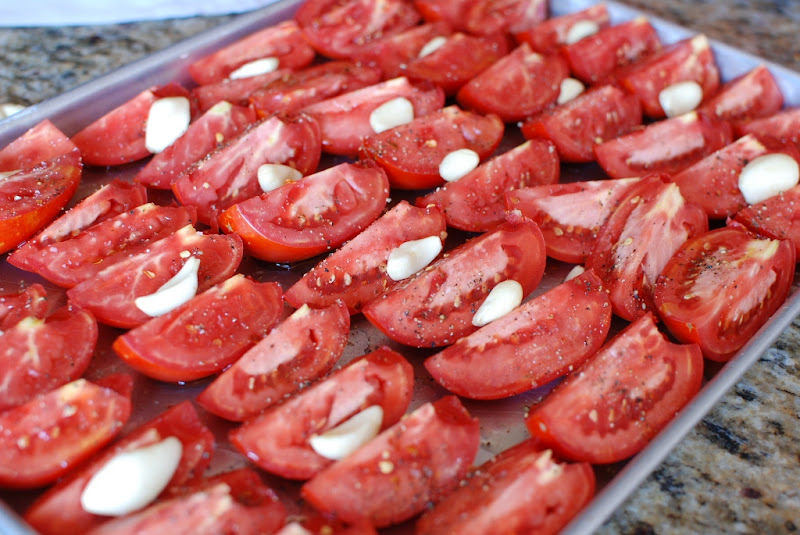 I layer the tomatoes with a nice olive oil, fresh basil, and the garlic that was in the oven with the tomatoes. 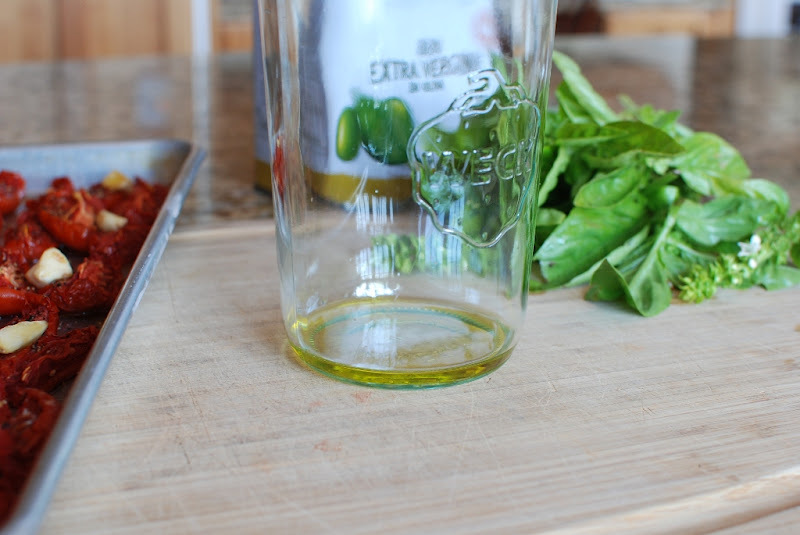 Add a small amount of oil in the bottom of a quart size jar. Toss in some of the garlic cloves and drizzle with more olive oil. 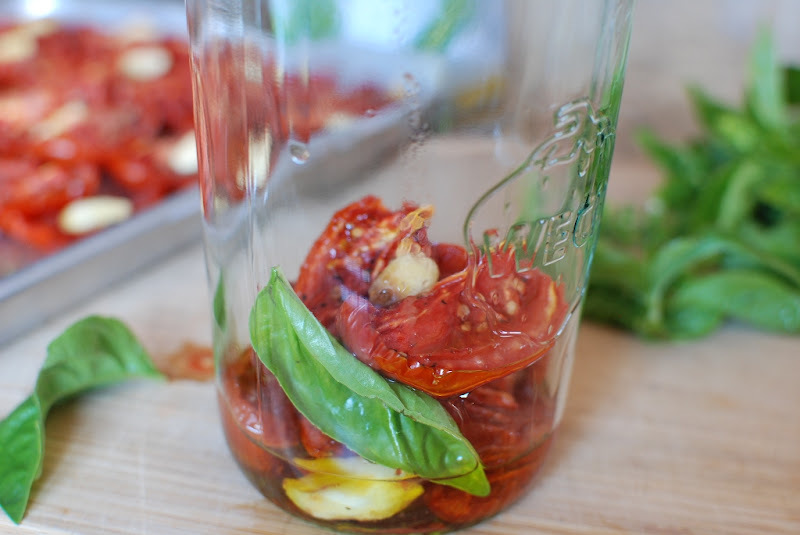 continue to layer the tomatoes, fresh basil and the garlic. Don’t waste any of the oil or juices from the pan. This oil is full of flavor. Cover the top completely with oil. Place the lid on top of the jar and store in the refrigerator. Think of the endless possibilities you now have in your refrigerator. Not only can you use the tomatoes in many different dishes you have infused olive oil that can be used for sauteing, tossing pasta, on salads. Anything. 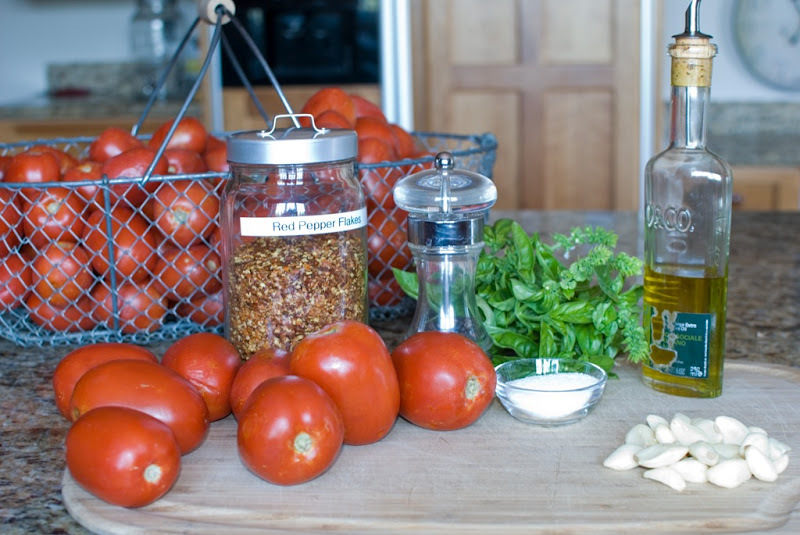 The tomatoes can be used on pizza’s, pastas, omelette’s, panini’s, sandwiches, bruschetta. Oh my goodness my mind is exploding with ideas right now. Makes about a quart jar smashed full of tomato goodness. Wash and core tomatoes. Cut each tomato in quarter. Drizzle 2 tablespoons of olive oil onto a baking sheet. 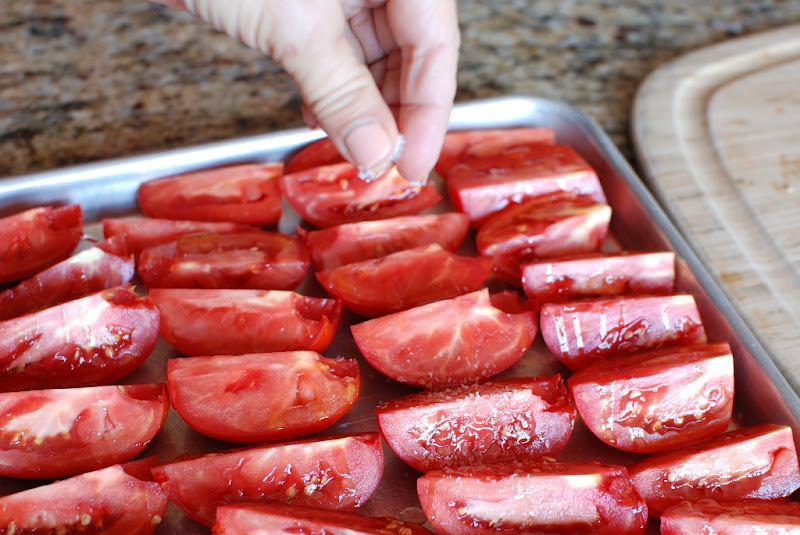 Arrange tomato wedges on the baking sheet. 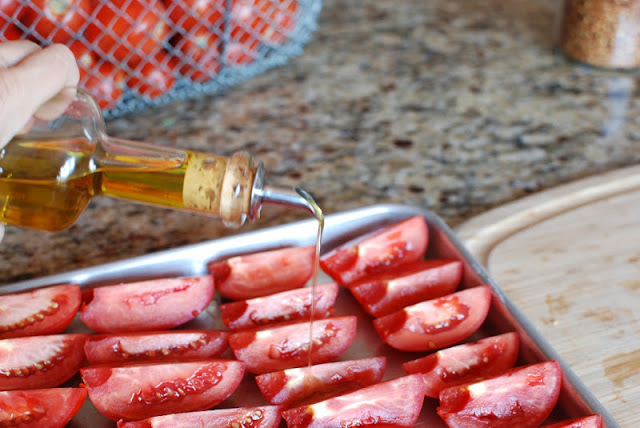 Drizzle with remaining oil. Sprinkle with salt, pepper and red pepper flakes. 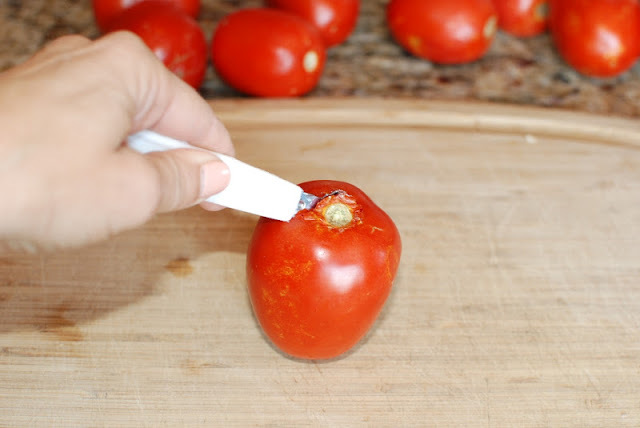 Place several garlic cloves around and on tomatoes. Bake in a preheated 175 degree oven for 10 hours. 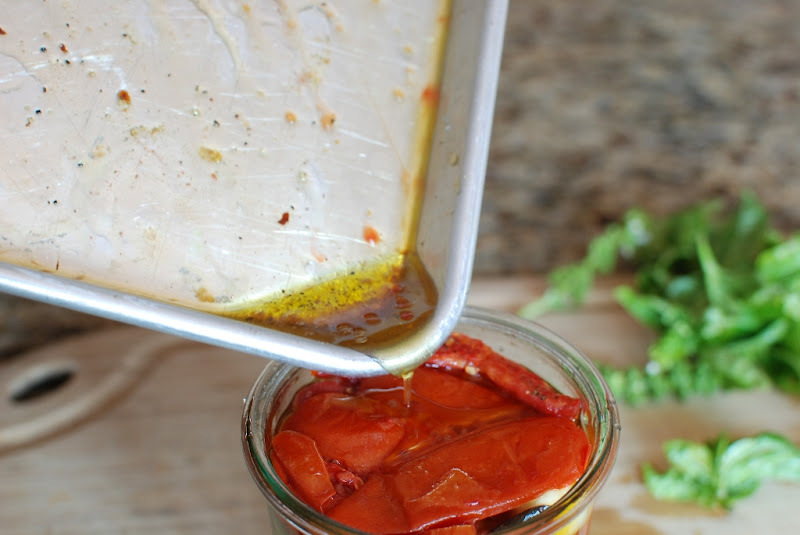 Remove roasted tomatoes from the oven and layer in a quart size jar with olive oil, garlic and fresh basil. Top with olive oil. Place on a tight fitting lid. Store in refrigerator. Makes 1 quart. 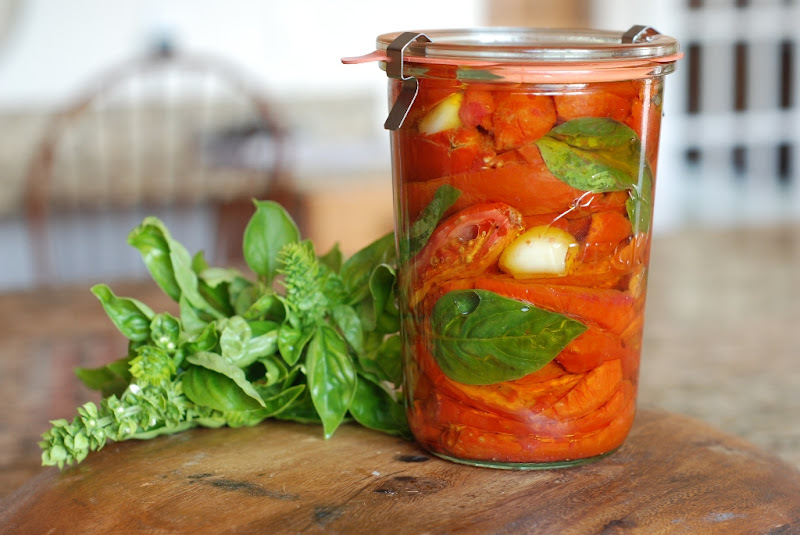 Preserving your own fruits and vegetables isn’t very economical. Especially if you have to purchase the produce. I don’t preserve food because I save money. I do it because it tastes better. my tomatoes looked worse than those above after only 4 hours, but let me tell you, they were GOOD! Thank you.. .thank you… thank you! I'm sad that my tomatoes are about gone. I'll have to wait another year. They are so fabulous. Thank you for your kind comment and your are so very welcome. I did this today!! They were WONDERFUL!!! only roasted 4 hours on 175… couldnt keep my hands off them! Preserving food is much cheaper if you buy produce from local farms in bulk. U-pick, where you can find them, is also a very affordable way to go. I got tomatoes at $0.60 p/lb (if you buy in 20# amounts) from a local farm and have canned 40 quarts of them so far. Unless you grow them yourself (which you did!) you can't get tomatoes for cheaper than that. 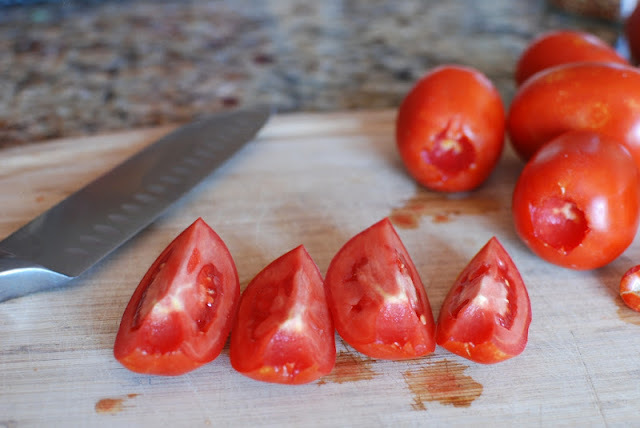 I did a cost analysis of home canned tomatoes versus store bought canned tomatoes and the cost is definitely much better when you can it yourself. However, it's a lot of work. I think it's worth it but I understand that many people don't. This recipe looks wonderful! I might do this before the season is completely over. The oil would probably be great in a salad dressing after the tomatoes are gone. I agree with you. It starts to get pricey if you have to purchase jars and lids. 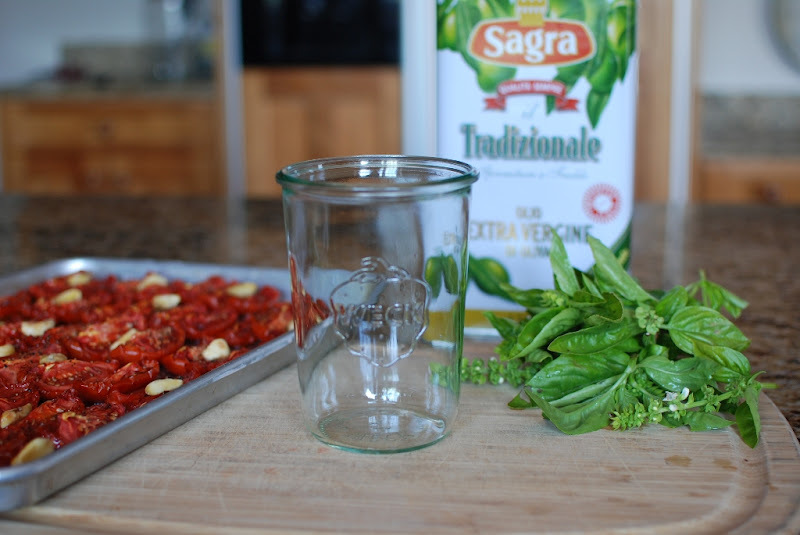 Once that investment is made the jars can be reused over and over again. 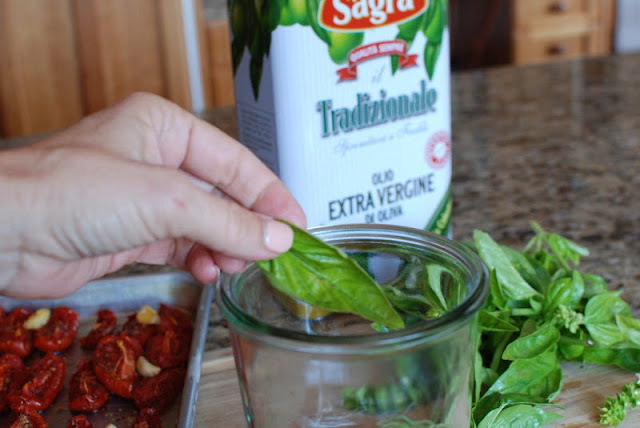 The oil is great in a salad dressing as well as tossing it in pasta. I hope you get a chance to try them. Thanks for the home canning plug. It looks good again. It is time that winter comes, so I have more time to cook again. Yum! Love the idea of having our own tomatoes all year long, just wish we'd grown more! Please be aware that this method is not safe in regards to food born illness, storing food under oil is prime breeding ground for botulism. Please refrigerate and eat within 5 days if you insist on this. Great advice. Thank you so much. I'm hoping my tomatoes will last 5 days. We are eating them so fast. I've got to get one of those tomato coring things you used! I cook with fresh tomatoes all the time and it's not my favorite thing to core with a knife. Where did you get it? Hi Boo. I think I just found it at a cooking store. Sur La Table might have one. I know the Bosch store has them. You just might find one at Target??? It is such a handy tool. Take care. Thank you for this wonderful tutorial. I'm going to pick up some of the great new Weck jars next time I go into work (@ WS) and make me some just like yours. Always look forward to your wonderful recipes. Bought peaches for the cobbler, but every single one of them was spongey and dry. Coveting your beautiful Utah peaches. If I worked at WS I'd roll over every pay check into buying everything in that store. I love the jars. They are so fun. I'm sorry about your peaches. Dang it. I wish I could smuggle a bushel across the border to you. Have a great day. 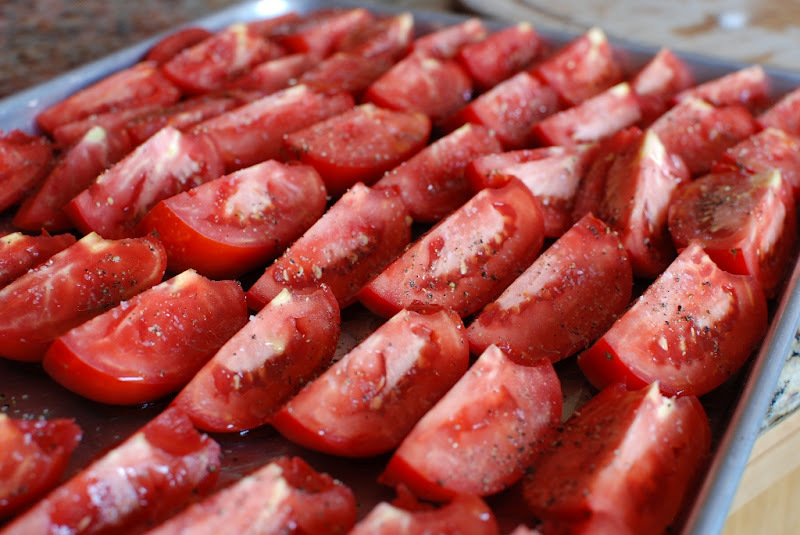 I just bet your tomatoes in Cyprus were divine. I hope you are as happy with the oven roast and the "Sun drying" method. Lovely tutorial. Very easy to follow. You've inspired me to add tomatoes to my garden next year. Thank you for taking the time to put this together and share with us. Now I know what I'm having for lunch. Thanks, Aarthi. Wow, I did the same thing, but roasted at 450 degrees for 45 min. Came out great! I sprinkled smoked paprika, also. YUM! Then froze them. OOOOO Loved the idea of smoked paprika. I'll be sure to use that next time. Thanks for your helpful hint and advice to make a quicker roasting time.